Kim Vasquez/Gray Lady Entertainment, Theatre Workshop of Nantucket (John Shea, Artistic Director), The Nantucket Historical Association, African Meeting House and The Nantucket Atheneum are pleased to present ANDRÉ DE SHIELDS in MINE EYES HAVE SEEN THE GLORY: FROM DOUGLASS TO DELIVERANCE inspired by Frederick Douglass, the great American abolitionist. . Directed by Alfred Preisser, choreographed by Tracy Jack, costume design by KATJA ANDREIEV, production management by ROBERT Michael Johnson and stage management by JENNIFER AHLBORN. 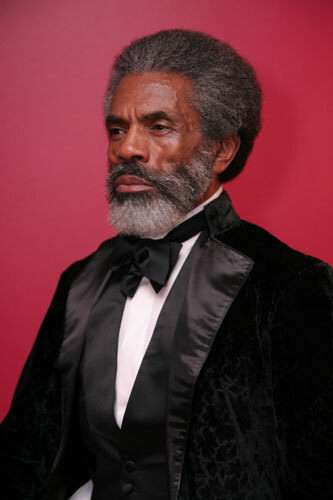 ANDRÉ DE SHIELDS is the recipient of the 2009 National Black Theatre Festival Living Legend Award, and the 2007 Village Voice OBIE Award for Sustained Excellence of Performance. In a career that has spanned over forty years, he is best known for his show-stopping performances in the original Broadway productions of four legendary musicals. Andre DeShields in Mine Eyes Have Seen The Glory an original one-act play about the life of Fredrick Douglass.